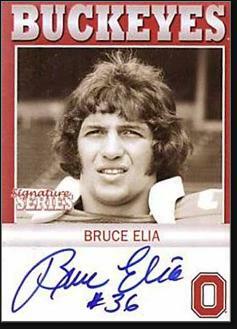 Bruce Louis Elia was born January 10, 1953 in Hoboken. He grew up in Cliffside Park and attended Cliffside Park High. The school had produced one All-American football player, quarterback Ed Mioduszewski, but was far from a football powerhouse. Bruce became the star of the Red Raiders varsity as a junior in 1969, playing linebacker and fullback. As a senior in 1970, he was voted all-state at both positions. At 6’1” and 215 pounds, Bruce was quick and muscular. He was high on a number of college recruiting lists; most schools wanted him as a fullback. He accepted a scholarship from Ohio State in 1971, and started several games in 1972—as a linebacker. Injuries had decimated the Buckeyes’ linebacking corps and Bruce’s experience at that position made him a sensible pick, despite his sophomore status. He played on a defensive unit with future NFL stars Randy Gradishar and Neal Colzie, as well as two-time All-American defensive end Van DeCree. That season, Ohio State lost just once, to Michigan State. A 14–11 home win over Michigan in the regular season finale earned the Buckeyes a spot in the Rose Bowl. They fell to USC, 42–17. In 1973, Champ Henson—the 1972 NCAA scoring leader—went down with a knee injury and Hayes inserted Bruce as his starting fullback. He ended up splitting time at the position with Pete Johnson, but was the primary fullback. Bruce led the team with 14 touchdowns and 84 points. The Buckeyes went 10–0–1 and defeated USC in the Rose Bowl. With the score 27–21 in the fourth quarter of that game, Bruce barreled into the end zone from two yards out to put the game away. The 1974 season found Bruce back at linebacker. He led the Buckeyes with 144 tackles as the team rode Archie Griffin’s Heisman Trophy season to a #1 ranking early in the year. They lost that honor when Michigan State beat them 16–13. Ohio State still won the Big Ten title, but lost to USC in the Rose Bowl 14–13 on a fourth-quarter two-point conversion. Bruce entered the 1975 NFL Draft as an undersized linebacker, albeit with an Ohio State pedigree. That was worth a 4th-round pick to the Miami Dolphins, who selected Bruce with the 100th overall selection. He was one of 13 Ohio State seniors to be taken that spring. He saw sporadic action with the Dolphins his rookie year, and was exposed in the 1976 expansion draft. The Tampa Bay Buccaneers grabbed Bruce, packaged him with two other players, and sent him to the San Francisco 49ers for quarterback Steve Spurrier. Bruce played three seasons in San Francisco, starting a total of seven games. He played middle linebacker between Willie Harper and Skip Vanderbundt in 1977 and recovered two fumbles. In his final NFL season, 1978, Bruce saw action in all 16 games as the 49ers went 2–14. Bruce moved back to Northern New Jersey, opening a real estate business and raising his family in Tenafly. His son, Bruce Jr., followed him into the business, specializing in investing in distressed properties.